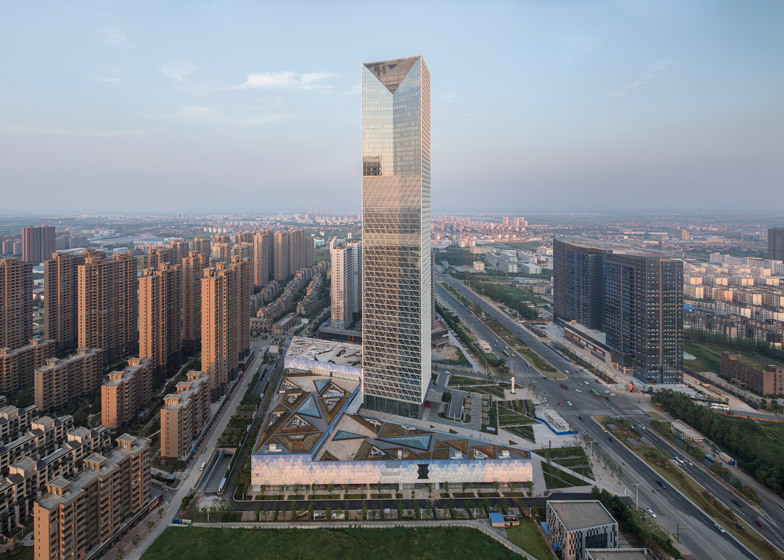 American firm SOM has completed a new tower in Nanchang, China, which features an exterior diagrid system that helps to shade the glass building. Rising 56 storeys, the Jiangxi Greenland Zifeng Tower is located in Gaoxin, a growing high-tech district in Nanchang. Rectangular in form, the 268-metre-tall glass skyscraper is clad in a diagrid structure made of triangular aluminium fins. The brise-soleil helps shade the building during the day, while LED lights embedded in the system illuminate the tower at night. "The fins shade the tower, preventing excessive solar heat gain and glare to the interior," said Skidmore, Owings & Merrill, a multidisciplinary practice founded nearly 80 years ago. "The fin intersections are a structural node with integrated white LED lights that, when illuminated at night, make the system's diagrid pattern and the tower's rectangular form glow across Gaoxin." The tower contains both offices and a hotel. The offices are located in the bottom two-thirds of the building, while the 20-storey hotel occupies the upper portion. The change in program is expressed on the exterior by a "great window" – an angled indentation on one side of the tower. "Formally, the great window transitions the floor plates to a suitable size and layout for the hotel function," said the firm. "Aesthetically, it marks the tower with a strong design, distinguishing it from the other towers that compose Nanchang's urban fabric." The tower is surrounded at ground level by a low-slung building with retail space and rooftop terraces. The skyscraper was developed by the Greenland Group, one of China's largest property developers. Since 2004, SOM has teamed with the Greenland Group to complete more than 10 buildings across China. The real estate company recently named the Jiangxi Greenland Zifeng Tower its "favourite completed high-rise building" of this year. "It is extremely gratifying for our design team to be recognised by their many friends and colleagues within the Greenland Group," said SOM managing director Michael Pfeffer. "SOM very much appreciates their longstanding commitment to bringing great design to the skylines of China's cities." China has dominated skyscraper construction over the past decade. The world's second tallest building in set to complete in Shanghai this year, however the foundations of a stalled 838-metre-high tower in Changsha are now being used as a fish farm. Last year, Chinese president Xi Jinping called for an end to the "weird architecture" that arose during China's construction boom. In a recent interview with Dezeen, Zaha Hadid Architects director Patrik Schumacher said it's getting harder for overseas firms to find work in China as the economy slows down and the government promotes local talent. Photography is by Lv Hengzhong.